I wasn’t going to post a recipe today since I honestly haven’t been cooking very much lately–we had Christmas dinner at P’s parents and we spent New Year’s Eve at a friend’s house. Indeed, it’s the same place we spent New Year’s Eve last year, so if you’d like to see some photos from 2006, you can check them out here. More on the recent New Year’s Eve soon, but for now–bagels! Michelle of Michellanea posted this bagel recipe a while ago for those of us in Italy dying for something, anything that we can smear some cream cheese on, and this recipe definitely delivers. In my baking frenzy around Christmas, I finally decided to give these a go, and I will definitely be making bagels more frequently around here from now on. The recipe is easy to follow and carry out; the only time-consuming part is waiting for the dough to rise. And then waiting for them to cool off before you dig in. The measurements are for those of us using metric, but everything is easily convertible these days online, for example at JoyofBaking.com. Dissolve yeast in 250 ml of warm water and add oil. In large bowl, mix together salt, sugar, and flour. Make a well in the center and add in yeast mixture. Mix together all ingredients, working in flour on the sides of the bowl in order to get an even mixture. Work dough into a ball. Cover bowl with a damp towel for about 40 minutes and let dough rise in a warm place; it should double in size. 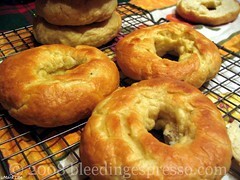 Put a piece of wax paper on the baking sheet you’ll be using for the bagels. Work the dough for about ten minutes. Divide into 8 little balls. Make a hole in the center of each ball and widen the opening until it begins to take the shape of a bagel. Let the bagels sit on the warm towel for another 15 minutes while you heat the oven up to 200°C. In the meantime, bring a large pan of water to a light boil (adding the 1 teaspoon of honey, which is a substitute for malt). Let each bagel boil lightly for about two minutes on each side and then remove and put them back on the damp towel. If you are adding sesame or poppy seeds, at this point, sprinkle them on a plate and press each bagel down lightly over them. After about five minutes, put the bagels on the wax paper-covered baking sheet and place in oven for about 20 or 25 minutes until they are golden brown (but not too brown – they will get a bit browner after they’ve cooled), flipping them after about 10 minutes to ensure even baking. Buon appetito and thanks again to Michelle for the great recipe! Bagels look gorgeous. They are always worth making. Happy New Year to you too. May all your dreams come true. I loved your meme, by the way, and may the year ahead be both peaceful and prosperous. Yeah! Glad you liked them. Buon anno! I hope you get your own .com you will love it! *Jessica, I wouldn’t have thought of making bagels myself either before Michelle posted that recipe. So happy to know they’re possible…and good! I visited a bagel bakery, in Queens, NY, when I was a lot younger. I remember the bakers rolling the dough into long tube like things, like when you make gnocci, then wrapping the dough around a wooden dowel, like a broom handle, then they unwrapped the the dough to the desired length and pinched the ends together. Looks like a trip to Hartford and the bagel store is in my plans. The bagels look really good -now all I have to do is find the conversions information and gather up some energy and ambition. It’s a toss up which will come first – conversions, energy or ambition though. Color me impressed! This looks like a good spur for introducing Umbrians to brunch as a concept. Yes, but WHERE DO YOU GET THE CREAM CHEESE??? *Gil, mmm, pick some up for me 🙂 I’ll have to try that rolling method; probably gets a smoother bagel than what I end up with. *Giusi, I should add that on my last go with this recipe I raised the oven temp to 220 and I liked the results–a bit more crispy on the outside. I also added raisins but no cinnamon. Delicious, but next time cinnamon too so long as I remember. *Robin, I hope you enjoy! I love bagels! I wonder if whole wheat flour can by substituted for all or part of the regular flour? I am definitely trying these. Do you know how long they will store? Man, do I miss bagels. This looks doable and the bagels look perfect! I’d love to make my own because the ones here now are so HUGE! I’m excited to try this. *Bobbie, I don’t see why you couldn’t substitute the flour, but as I know nothing of the measurements (if it needs to be adjusted) I’d check on that. They stay fresh for just a day or two like all bagels, but as Michelle wrote on her original recipe, she freezes any uneaten bagels by slicing them and putting them in paper bags and then in plastic bags. *Miss Expatria, no need to miss any more! *Jen, these end up being a pretty manageable size; let me know how they turn out!